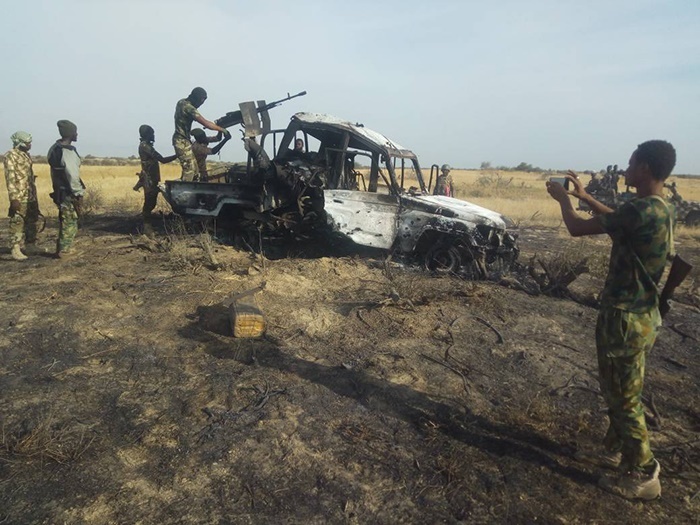 A military official examining a gun truck of Boko Haram burnt during the exchange of gunfire. While Boko Haram seems to be intensifying their attacks on army bases; the military is also fighting back to decimate the insurgents. “The operation was conducted on October 23 after Intelligence, Surveillance and Reconnaissance (ISR) missions revealed the presence of some BHT vehicles and several fighters camouflaged under thick vegetation within the area, where the BHTs had converged in order to launch attacks against own troops’ positions,” he said. Don't forget to share this article with your friends and family.